Over the last month or so, the supporting cast for The CW’s upcoming Arrow spin-off The Flash has been fleshed out, and we’re starting to get a clearer picture of what the show will look like. In addition to the casting announcement for the series’ villains (Professor Zoom and Killer Frost, respectively), it looks like series regulars will include Barry’s love interest, her police detective father, and a mechanical engineer named Cisco. But while the inclusion of such characters isn’t really all that groundbreaking, who they’ve cast in these roles definitely is. Also, “Cisco” refers to Cisco Ramon, a.k.a. Vibe. That’s right, y’all, Flash isn’t going to be the only DC hero on the show. We’re actually getting a live action Vibe, too. Broadway star Carlos Valdes will play Latino superhero Vibe. IRIS — 22-28 — African-American — As smart as she is beautiful, Iris is in grad school studying psychology. She’s also Barry’s mile a minute, fast-talking, quick-witted best friend. Her father, Detective West, took in Barry when his mother was murdered, and his father was wrongly accused and imprisoned for her murder. In a tough childhood for Barry, she was the one “not tough” thing. She’s unaware of Barry’s strong feelings for her. 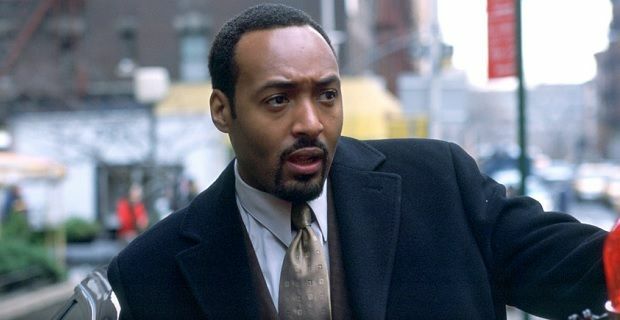 Several weeks before the news of the casting of Iris broke, Warner announced it had cast longtime Law & Order alum Jesse L. Martin as her father, Detective West. While this character seems to have been created solely for the television series and doesn’t have a comic book counterpart, The WB/CW’s track record of original characters for its live action DC adaptations is pretty strong (I’m looking at you Lionel Luthor and John Diggle). According to the character description, Detective West will play the role of a surrogate father to Barry. Jesse L. Martin on Law & Order. Dun-Dun. I know the topic of cross-racial casting comes up a lot on this site. And many of us come from both sides of the argument. But you can count me in the camp of folks who thinks “it’s about time” when it comes to seeing people of color portraying characters who have traditionally been white in the comics. While Barry Allen will still be a white dude (thus far charismatically portrayed by Glee‘s Grant Gustin on Arrow), the fact that the Wests are an African American family is powerful indeed. Because if you know anything about The Flash mythology, you’d know that Iris’ nephew Wally will one day inherit the mantle from Barry. And for legions of DC fans, Wally West is their definitive Flash. So what are the chances we’ll see Kid Flash on the show? (Arrow has already proven that the producers are not above including superhero sidekicks in their show since they’ve already introduced Roy Harper, a.k.a Speedy, a.k.a. Arsenal, a.k.a. Red Arrow, a.k.a. damn, this dude’s had a lot of superhero code names). I mean, we’ve already seen Wally’s future wife Linda on Arrow so who knows? Wally is probably a tween at this point, though, so chances are he and Linda are probably not going to be an item anytime soon. Whether or not Linda Park is also a series regular is irrelevant. If nothing else, having such a diverse cast of characters on a show as high profile as The Flash is going to be nothing but good. While I wasn’t completely sold on Arrow last season, I’ve definitely committed to the show and its universe this season, and I’m excited to see where Flash will take the mythology in the Fall.